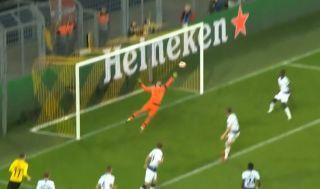 Tottenham have goalkeeper Hugo Lloris to thank for being level at 0-0 at half time against Borussia Dortmund right now. Spurs have not been at their best in Germany this evening, but have the luxury of a 3-0 aggregate lead from the first leg of this Champions League encounter. They also have Lloris in unbeatable form right now, with the French shot-stopper having to work hard to keep Dortmund at bay as they try everything to overturn this heavy deficit.